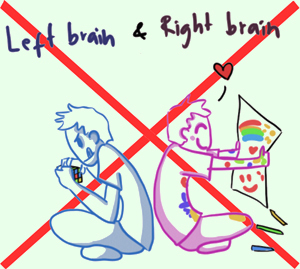 In an earlier post in this blog, I addressed the widespread but mistaken idea that some people are more “left-brained” while others are more “right-brained”, and that the former are more rational while the latter are more creative. 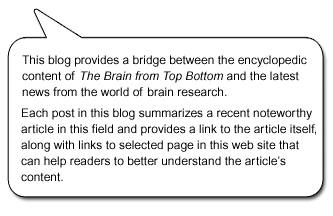 No evidence for this idea was found in a study on brain connectivity in over 1000 individuals, reported in the article “An Evaluation of the Left-Brain vs. Right-Brain Hypothesis with Resting State Functional Connectivity Magnetic Resonance Imaging”, published in August 2013 in the journal Plos One. As this study showed, humans do not have more neural pathways connected in one hemisphere of their brain than in the other, and the two hemispheres work in close collaboration. But as I noted in my earlier blog post and as Dave Farina and Joel Frohlich noted in theirs (“No, You’re Not Left-Brained or Right-Brained”), this does not contradict the fact that certain brain networks are more lateralized in one hemisphere than in the other. The 2013 study identified some 20 brain networks whose main “hubs” (or nodes) are localized more in one of the two hemispheres. The first example that comes to mind, of course, involves the brain’s language functions, for which the networks associated with syntax are lateralized in the left hemisphere in more than 9 out of every 10 people. Another example is the default-mode network, discussed in my posts last week and two weeks earlier, which appears not to be perfectly symmetrical but but rather to involve more areas in the left hemisphere than in the right. In contrast, the brain network that controls attention involves slightly more areas in the right hemisphere than in the left.